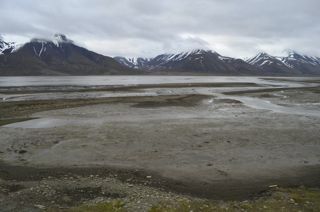 The latest in a series of journal articles based the MAMM project field work has been published today. The article (A cautionary tale: A study of a methane enhancement over the North Sea) is initially behind a paywall, but will become freely available after 6 months. Tweet me at @civiltalker if you want to request a copy. After many moons of data analysis, and countless graphs and figures, the paper is finally out. It seems a long time ago that I missed out on a flight that circuited a gas field in the North Sea, looking for any methane that might has escaped the gas rigs or pipes. Nearly 4 years on, the work has been published in a peer-reviewed publication, and we can all relax bask in its glory! 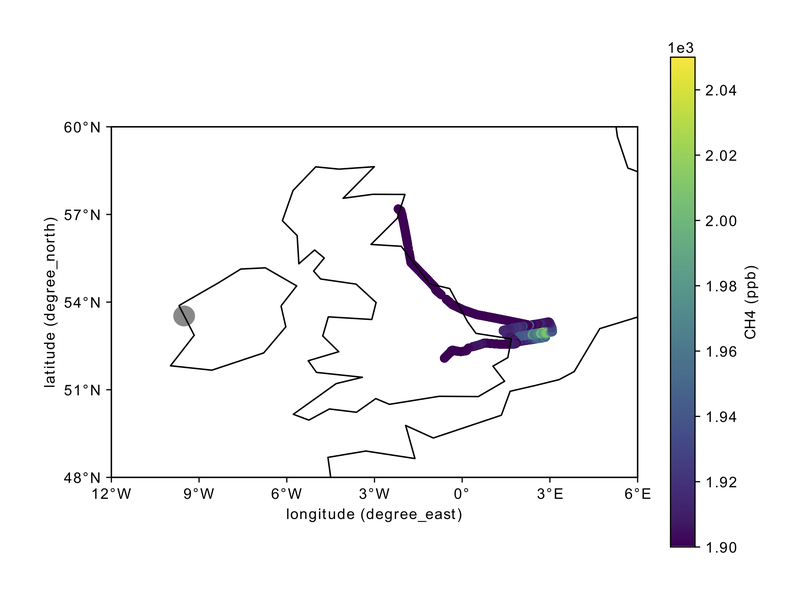 As it’s paywalled for the first 6 months, I thought I would bash out a quick post about it here, even though it’s technically not about Arctic methane, as we sampled off the east coast of the UK. 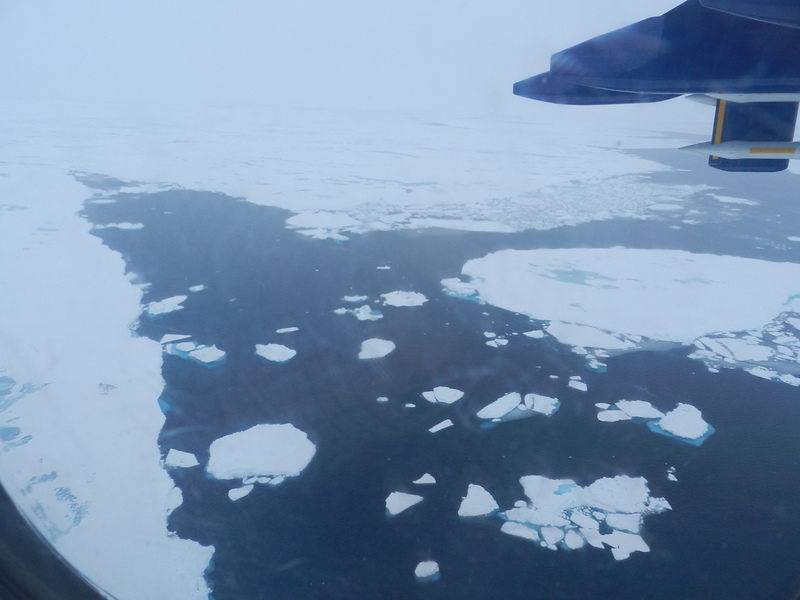 But it was a flight on the way back from the Arctic, at the end of our 2013 field campaign, during which we took advantage of the weather to get some good science in. 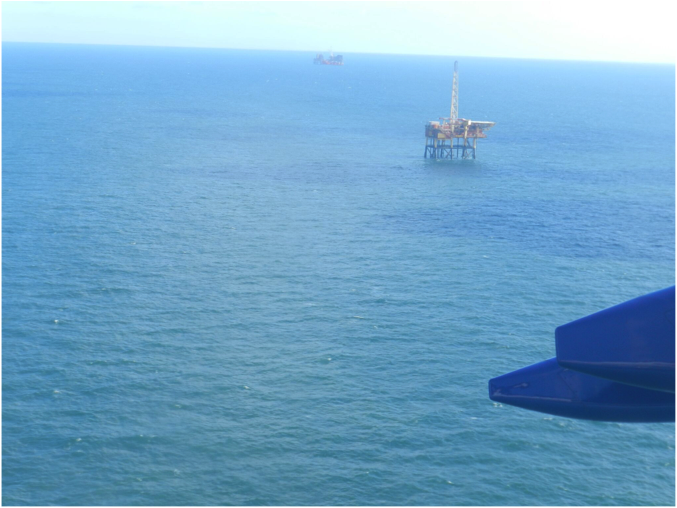 Measuring methane during a flight around a North Sea gas rig. Photo credit: John Pyle. The flight track from Aberdeen to Cranfield, with a detour around the North Sea. Colours show methane measured on board the aircraft. Methane observed during the flight, zoomed in around the Leman Gas field. Wind barbs show the wind direction. The thin blue line represents the coast of East Anglia. The wind barbs show that the wind was coming from the North West. The colours show the amount of methane we measured in the air, during this flight at about 80m above sea level, and the red box is the rough location of the gas field area. On first glance, you can see more yellow (ie more methane) can be seen downwind of the gas field. But as you may have guessed (the paper is called “A cautionary tale” after all), this isn’t the whole story. We had a three-pronged approach to analysing the data. We worked out theoretically how much methane would have to be emitted from the gas field region to explain our results by a gas field source alone. It was quite a lot! However, we have no idea if this was a one off pulse of emissions, or a continuous release. In the former case, a large but short pulse isn’t too surprising. As a continuous release though, it would be a huge amount in total! We modelled the scenario, using the UK’s emissions inventory, which is a map which tells you how much methane is emitted in a year. So we assume it’s emitted at the same rate throughout the year (not a perfect assumption, but we have nothing better to go on), and use a meteorological model to blow the methane through the atmosphere by the wind. Then we see how much methane arrives at the location of the aircraft. The answer was “not enough”. We had to add an additional source of methane to the North Sea gas field area to get the model to look like the observations. Then we worked out the amount of carbon-13 in the methane source. The amount of carbon-13 in methane varies according to its source. Natural gas has a lot of it, and is described as heavy compared to average (the atmospheric average has more carbon-12). Biogenic sources (wetlands, agriculture) has less, and so is described as light. To our surprise, the carbon-13 isotopes showed that our methane did not look like natural gas from the North Sea rigs. It was too light! How to reconcile these somewhat contradictory analyses? We have two possibilities. One is that the methane source is not from the gas rigs, but is from the land. Perhaps some kind of industrial process that emits a short pulse of methane. Maybe our model is not quite good enough to capture the local winds, and that explains why we don’t reproduce the right pattern if we include an extra source on land. In this case, it is just by chance that we see the methane downwind of a gas field, as it’s coming from the land. Or, the other is that maybe we have a combination of methane sources. Some additional methane (75%) is coming from the land, above what is in the inventory. And the remaining 25% is coming from the gas fields. This is consistent with the carbon-13 isotopes, and perhaps feels intuitively a little more plausible. However I don’t think there’s evidence that tips the balance either way, so both options may be possible. So why is this a cautionary tale? Surely not just that science is hard and data is messy! No, the key message is that if we had not measured the isotopes, we could easily have assumed that the methane was indeed all coming from the gas rigs. We could have concluded that there was a large fugitive emission from this gas field on this day. It’s a reminder to ourselves, and hopefully others, to refrain from jumping to conclusions, and to make sure you collect as much relevant data as you can to explain your results thoroughly. Cain, M., et al. (2017), A cautionary tale: A study of a methane enhancement over the North Sea, J. Geophys. Res. Atmos., 122, doi:10.1002/2017JD026626. More info on methane isotopes in this blog post. It’s been a while since we posted here! After the intensity of the field work, the MAMM team has spent the last few years analysing the results, running computer models, and some of the team have even found the time to get married (not to each other!) or have a baby. Suffice to say, we have been busy. Now the research has officially ended, we have published — or are in the process of getting published — many journal articles. Below is a list of those that are already published. Most are freely available by clicking on the title of the article. As they are scientific articles, try as we might, they may not be the easiest to read for the uninitiated. So in time, we will post here some summary blog posts. In the interim, you can take a look at the poster below for some pretty pictures and a few highlights from MAMM without all the gory details. If you are new here and have no idea what I’m on about, you can read a brief introduction to this blog here, or a slightly longer introduction to the project here. 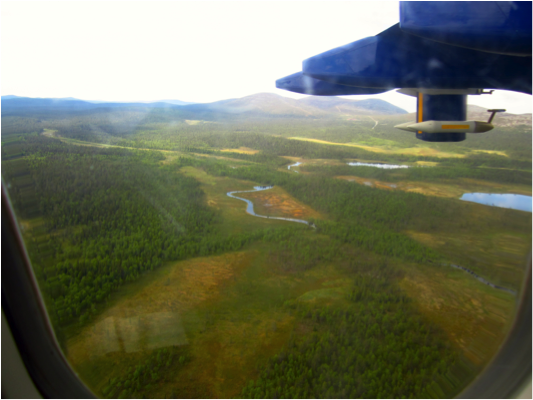 Some highlights from our Arctic Methane research. Nisbet, E. G., E. J. Dlugokencky, M. R. Manning, D. Lowry, R. E. Fisher, J. L. France, S. E. Michel, J. B. Miller, J. W. C. White, B. Vaughn, P. Bousquet, J. A. Pyle, N. J. Warwick, M. Cain, R. Brownlow, G. Zazzeri, M. Lanoisellé, A. C. Manning, E. Gloor, D. E. J. Worthy, E.-G. Brunke, C. Labuschagne, E. W. Wolff, A. L. Ganesan (2016), Rising atmospheric methane: 2007–2014 growth and isotopic shift, Global Biogeochem. Cycles, 30, doi:10.1002/2016GB005406. Myhre, C. L., B. Ferré, S. M. Platt, A. Silyakova, O. Hermansen, G. Allen, I. Pisso, N. Schmidbauer, A.Stohl, J.Pitt, P.Jansson, J.Greinert, C. Percival, A.M.Fjaeraa, S.J.O’Shea, M. Gallagher, M.LeBreton, K.N.Bower, S.J.B.Bauguitte, S.Dalsøren, S. Vadakkepuliyambatta, R. E. Fisher, E.G.Nisbet, D.Lowry, G.Myhre, J.A.Pyle, M.Cain, and J. Mienert (2016), Extensive release of methane from Arctic seabed west of Svalbard during summer 2014 does not influence the atmosphere, Geophys. Res. Lett., 43, 4624–4631, doi:10.1002/2016GL068999. O’Shea, S. J., Allen, G., Gallagher, M. W., Bower, K., Illingworth, S. M., Muller, J. B. A., Jones, B. T., Percival, C. J., Bauguitte, S. J-B., Cain, M., Warwick, N., Quiquet, A., Skiba, U., Drewer, J., Dinsmore, K., Nisbet, E. G., Lowry, D., Fisher, R. E., France, J. L., Aurela, M., Lohila, A., Hayman, G., George, C., Clark, D. B., Manning, A. J., Friend, A. D., and Pyle, J. (2014) Methane and carbon dioxide fluxes and their regional scalability for the European Arctic wetlands during the MAMM project in summer 2012, Atmos. Chem. Phys., 14, 13159-13174, doi:10.5194/acp-14-13159-2014. Allen, G., Illingworth, S. M., O’Shea, S. J., Newman, S., Vance, A., Bauguitte, S. J.-B., Marenco, F., Kent, J., Bower, K., Gallagher, M. W., Muller, J., Percival, C. J., Harlow, C., Lee, J., and Taylor, J. P. (2014) Atmospheric composition and thermodynamic retrievals from the ARIES airborne TIR-FTS system – Part 2: Validation and results from aircraft campaigns, Atmos. Meas. Tech., 7, 4401-4416, doi:10.5194/amt-7-4401-2014. Pitt, J. R., Le Breton, M., Allen, G., Percival, C. J., Gallagher, M. W., Bauguitte, S. J.-B., O’Shea, S. J., Muller, J. B. A., Zahniser, M. S., Pyle, J., and Palmer, P. I. (2016) The development and evaluation of airborne in situ N2O and CH4 sampling using a quantum cascade laser absorption spectrometer (QCLAS), Atmos. Meas. Tech., 9, 63-77, doi:10.5194/amt-9-63-2016. Jones, B. T., J.B.A. Muller, S. J. O’Shea, A. Bacak, M. Le Breton, T. J. Bannan, K. E. Leather, A. Murray Booth, S. Illingworth, K. Bower, M. W. Gallagher, G. Allen, D. E. Shallcross, S. J.-B. Bauguitte, J. A. Pyle, C. J. Percival (2014) Airborne measurements of HC(O)OH in the European Arctic: A winter – summer comparison, 99, 556–567, DOI:10.1016/j.atmosenv.2014.10.030. 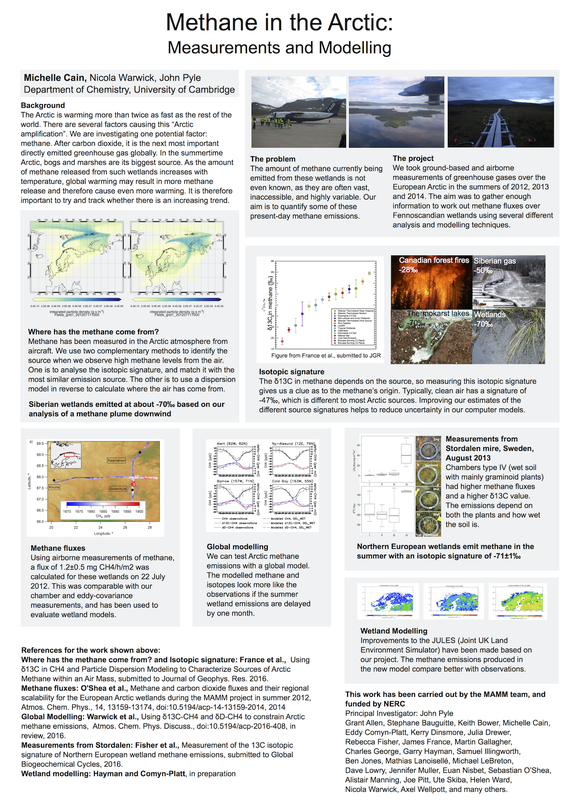 Dinsmore, K. J., Drewer, J., Levy, P. E., George, C., Lohila, A., Aurela, M., and Skiba, U.: Growing season CH4 and N2O fluxes from a sub-arctic landscape in northern Finland, Biogeosciences Discuss., doi:10.5194/bg-2016-238, in review, 2016. Warwick, N. J., Cain, M. L., Fisher, R., France, J. L., Lowry, D., Michel, S. E., Nisbet, E. G., Vaughn, B. H., White, J. W. C., and Pyle, J. A.: Using δ13C-CH4 and δD-CH4 to constrain Arctic methane emissions, Atmos. Chem. Phys. Discuss., doi:10.5194/acp-2016-408, in review, 2016. 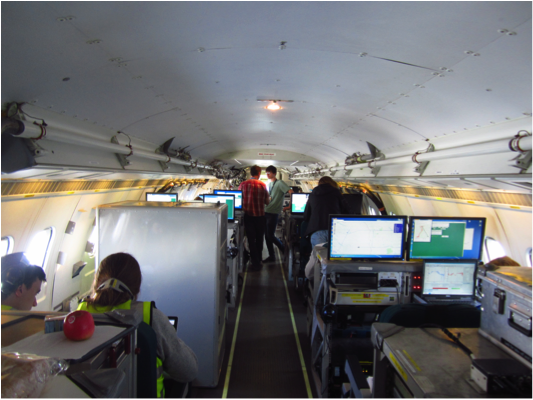 Today, the MAMM team have had a new paper published based on one of our flights in July 2012. It’s quite exciting, as published papers are the end result of all our hard work, and the main way that others can find out about what we’ve been studying. 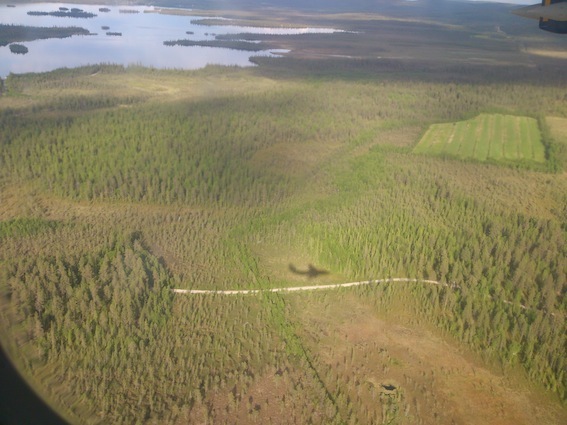 The paper is about emissions of methane and carbon dioxide from wetlands in Finland and Sweden, which is no surprise if you followed our field work! We used measurements of methane, carbon dioxide and the meteorology from the aircraft to work out how much of these greenhouse gases was coming off from the wetlands to explain the pattern we saw in the measurements. This technique for working out the methane and carbon dioxide emissions compared really well with other methods we have of working this out from measurements on the ground or on towers just above the ground. This gives us confidence that the methods we have used are sound and the emissions we have worked out are good estimates. We compared these emissions estimates with some computer simulations, and it turned out that our emissions were much larger than what the models simulated. This kind of comparison is a good starting point to try and improve the models and to make them more realistic, which is what we want if we are to use the models to try and test how much methane will be released under different conditions. O’Shea, S. J., Allen, G., Gallagher, M. W., Bower, K., Illingworth, S. M., Muller, J. B. A., Jones, B. T., Percival, C. J., Bauguitte, S. J-B., Cain, M., Warwick, N., Quiquet, A., Skiba, U., Drewer, J., Dinsmore, K., Nisbet, E. G., Lowry, D., Fisher, R. E., France, J. L., Aurela, M., Lohila, A., Hayman, G., George, C., Clark, D. B., Manning, A. J., Friend, A. D., and Pyle, J.: Methane and carbon dioxide fluxes and their regional scalability for the European Arctic wetlands during the MAMM project in summer 2012, Atmos. Chem. Phys., 14, 13159-13174, doi:10.5194/acp-14-13159-2014, 2014. For the previous 2 days of the MAGIC campaign we have carried out work around Svalbard to look for methane hydrate emissions off the west coast of the archipelago and to test a new inertial navigation system at high latitudes. On Tuesday we left Kiruna in Northern Sweden at 0900 UTC (which is another way of saying GMT), transiting at high level before descending to 100 ft above sea level to rendezvous with the Norwegian research ship, the RV Helmer Hanssen, currently carrying out a survey of the methane above seabed bubble plumes, and looking for elevated methane in the atmosphere. We flew past the ship twice before heading to Longyearbyen to refuel and prepare for the next sortie of the day. The second sortie was a 1400 UTC take off heading out to 10°E then to 84°N at 27000 ft. Stratospheric air was encountered at these high latitudes. Following a leg at 84°N across to 20°E and a successful navigation equipment test we headed back to the 10°E line heading for lower altitudes to look for methane emissions above leads (wide cracks) in the Arctic sea ice pack. Our descents to 100 ft were very intermittent due to low cloud cover, but lead development was seen near 81.5°N, and these became more frequent as we flew south. 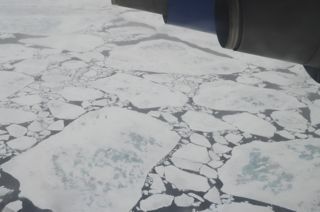 The edge of the ice pack was close to 80.1°N and fragments of ice from the pack were observed to 79.9°N. Methane seemed to increase very slightly after reaching open water but changes were not much above instrument measurement precision. 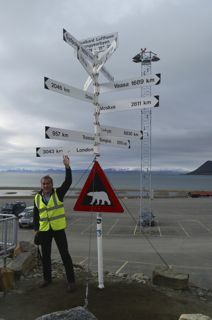 After debrief we headed to the centre of Longyearbyen. The taxi drivers have plenty of great stories about the town, some not appropriate for print. We stayed in the Radisson hotel, which apparently was transported from Lillehammer after the 1994 winter Olympics. 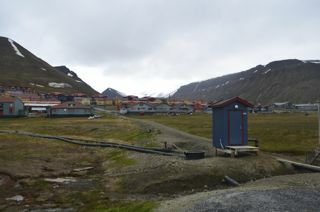 The cloud cover made the town quite gloomy, not helped by the remnants and scars of coal mining on the hillsides, although residential developments do add some colour. MAGIC leader, John Pyle, a long way from home. 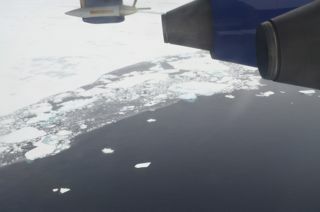 The first sortie for Wednesday was a 0900 UTC departure aimed at surveying the hydrate bubble line west of Prins Karls Forland where the water depth is approximately 400 m. This has been the focus of extensive acoustic and geophysical study by European groups over the past decade. Many methane bubble plumes have been observed rising from the sea bed, but these tend to dissolve or be oxidized as they rise in the water column and their breaching of the surface is still hotly debated, hence our current atmospheric surveys. The data from the profiles across this zone will now be analysed to see if there is elevated methane, although first impressions are that this is not a very big source in the context of global methane emissions. Frequent sightings of whales and seals were reported back from the flight deck, but from my seat under the wing these went mostly unobserved. 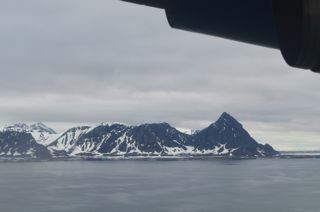 A low level (1000 ft) return to Lonyearbyen allowed some great views of the coastal scenery including mountains, glaciers and wetlands. Another hour was spent over the bubble zone after lunch and refuel before climbing to 25,000 ft for the return transit to Kiruna. 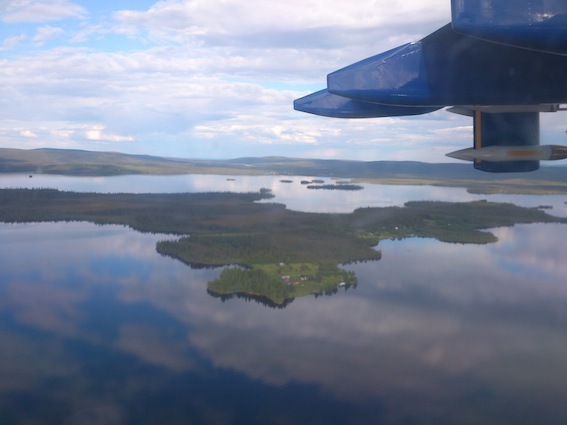 Spectacular views of the Norwegian coast were a distraction from watching the methane displays until the start of the descent into Kiruna. A plume of long-range transport of emitted methane was observed and sampled between 20,000 and 18,000 ft, and the air mass history will be analysed to interpret the source of this. 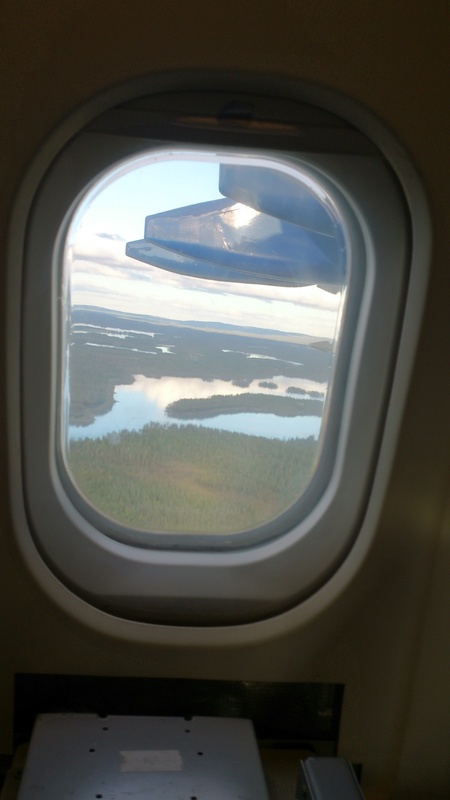 We landed in Kiruna at 1700 UTC. We had flown around 13 hours in the 2 days and I had collected close to 50 samples of air for subsequent analysis back at Royal Holloway, University of London. 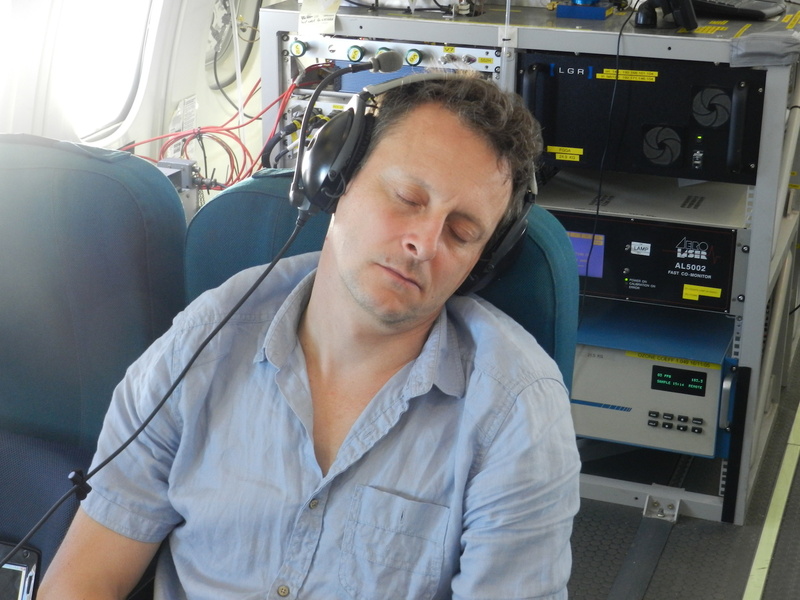 So lots of tired crew and scientists but a very rewarding and informative trip. Hope to see a little more of the midnight sun if I get another opportunity to go up there. We made it to 84N and did some really good science en route. The second radar altimeter (without which extended flying below 100ft is impossible) was playing up on the ground in Kiruna so I was nervous that we would not be able to do any of the low level work that we’d planned. In the event, it righted itself en route and we were able to fly down to 50ft over the ocean off Svalbard, including flight round the Norwegian research vessel of our MOCA (one of the other projects working on this field campaign) colleagues. 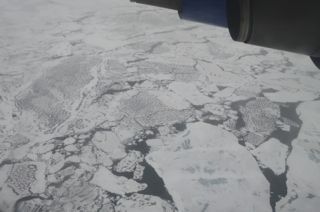 The afternoon flight took us to 84N, a record for FAAM, with a low level return over ice, mixed ice and open ocean to Svalbard. We have got excellent methane data to investigate whether the ocean is a methane source at the edge of the sea ice. It was an exciting flight, if a little too much for Stéph (see photo). It’s been a busy few days to start the MAGIC/MAMM field work, and I haven’t had a chance to write a blog about it, except the prelude in my previous post. 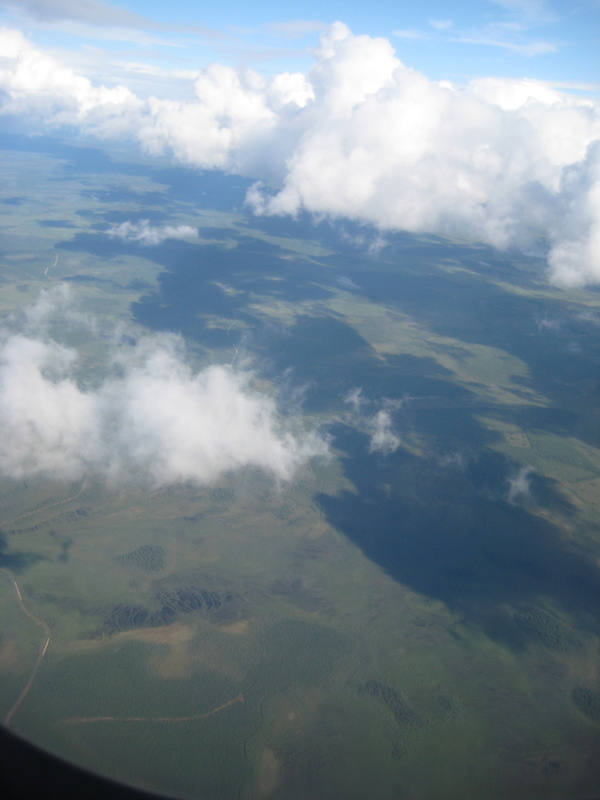 We did have a successful flight over wetlands yesterday, and i managed to get a few good photos out of the window. 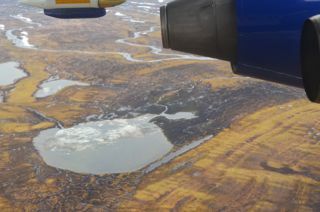 So for now, here’s a couple of pictures to whet your appetite, and a link to a video so you can see the kind of land we flew over. Link to a video clip from the flight by Michelle Cain. It’s 06:09am on a Sunday, and I am sitting on a train bound for London. I am glad that most people seem to be travellers who have slept and deliberately got up early for the train, and don’t look like they have been partying until dawn. I’m not sure I could handle such revelry at this previously unknown hour on a Sunday. The only reason I am not only awake, but also out and about, is that I’m heading to Heathrow to begin my journey up to Kiruna in Northern Sweden for the final batch of field work for MAMM, which has been christened MAGIC because it’s a collaboration between several different projects (and presumably someone thought that MAGIC sounded pretty cool). Like in previous years, this is quite an epic journey. As my colleague Ines and I want to arrive reasonably early on Monday in Kiruna (so we can do the research flight in the afternoon), we are heading to Stockholm today, staying the night, and then getting an even earlier flight tomorrow to Kiruna. Luckily, we are staying over on a converted Jumbo Jet, which is pretty much at the airport. So I’ll get a lie in tomorrow. The research flight tomorrow is to be a wetland survey. We have done these kinds of flights on previous years, so we want to repeat it to see if we get the same results this time. We are measuring methane over the wetlands, to see if different types of bogs, swamps, forests and fens give off different amounts of methane. We also want to see how the methane changes from season to season, and depending on the recent weather. Two years ago we flew a few weeks later in July. This year will be the earliest we’ve been (the research aircraft arrives on 30 June), so you might expect it to be the coolest. I looked at the forecasts though, and it looks quite warm (possibly 15C where we’re going), so there’s a chance it’ll be warmer than some of the periods we’ve been before! I think northern Sweden is a little bit like the UK in that respect – you don’t know quite when the hottest part of the summer is going to be, and don’t be too surprised to get rain at any time! 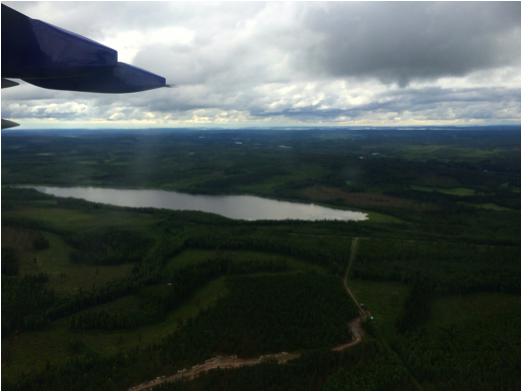 Flying over wetlands, lakes and forests last year. We are featured on the Planet Earth podcast! 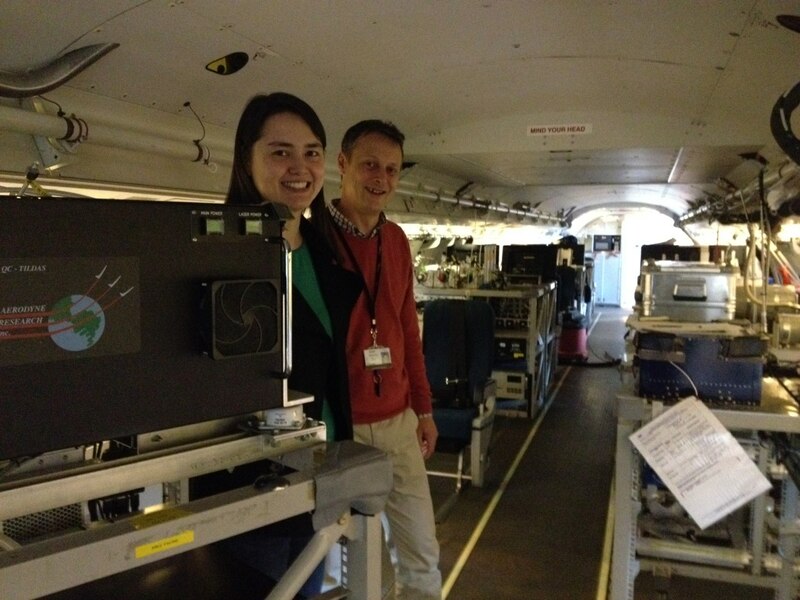 Stéphane and me next to the QCL (quantum cascade laser) instrument, which measures methane and nitrous oxide, on board the Atmospheric Research Aircraft. It really is a lab in the sky! Photo by Sue Nelson of Boffin Media. A couple of weeks ago, I received an email, asking if I could take part in recording a Planet Earth podcast, with one of my colleagues (Planet Earth is the Natural Environment Research Council’s magazine). Of course I immediately agreed, as the MAMM team love sharing their work with the world! 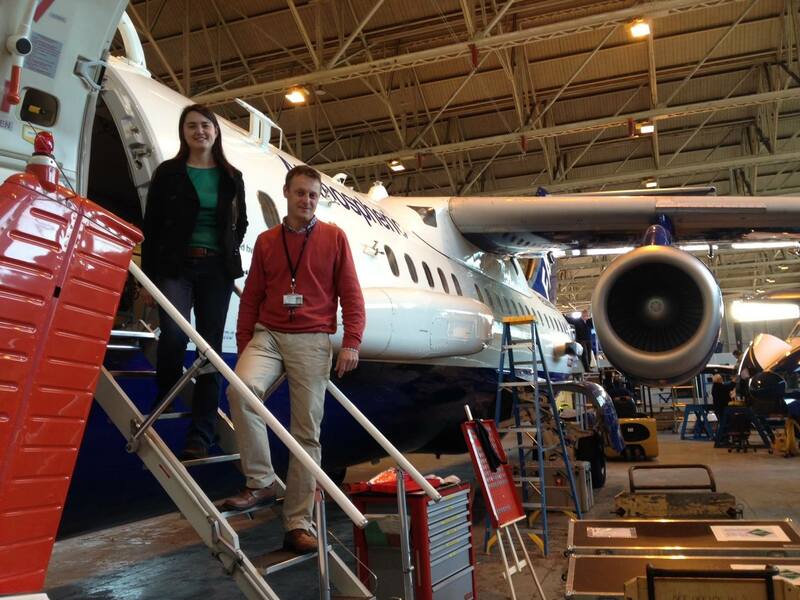 So, a few Mondays ago, I went over to Cranfield, where the Atmospheric Research Aircraft is based when it’s not on field campaigns, to meet with Stéphane Bauguitte, one of the MAMM team who runs the fast greenhouse gas analyser and is a flight manager (amongst other things), and Sue Nelson, who was interviewing us and recording the podcast. It was lucky that the aircraft was not only in the hangar and not out flying, but the instruments we use to measure the methane in the air were still on board. Many other projects don’t need to measure the methane, so the engineers remove the unnecessary kit, and replace it with other instruments to measure different things in the atmosphere. We had a great time showing Sue the aircraft — I think she was suitably impressed by its size! Listen to the podcast to find out just how noisy it is on board, and to find out about our exploits in the Arctic. 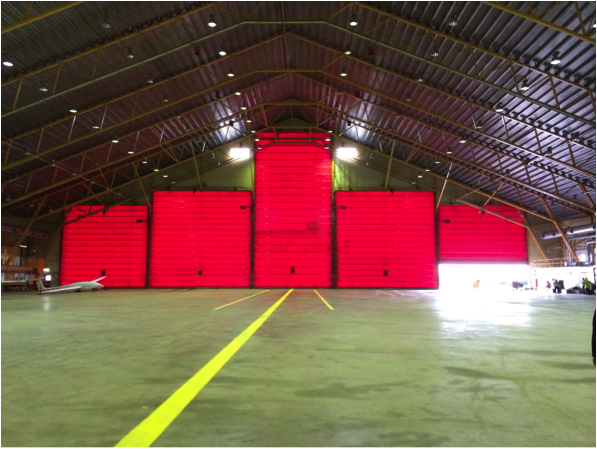 The aircraft at home in the hangar at Cranfield. Photo by Sue Nelson of Boffin Media. There are currently a couple of papers from the MAMM project under open review. This means that anyone can access them, and anyone can review then and post their comments! Once the review process is over, if any issues are addressed and the official reviewers are happy, the papers are published fully. They are still free to access, although there are no comments on the final papers. O’Shea, S. J., Allen, G., Gallagher, M. W., Bower, K., Illingworth, S. M., Muller, J. B. A., Jones, B., Percival, C. J., Bauguitte, S. J-B., Cain, M., Warwick, N., Quiquet, A., Skiba, U., Drewer, J., Dinsmore, K., Nisbet, E. G., Lowry, D., Fisher, R. E., France, J. L., Aurela, M., Lohila, A., Hayman, G., George, C., Clark, D., Manning, A. J., Friend, A. D., and Pyle, J.: Methane and carbon dioxide fluxes and their regional scalability for the European Arctic wetlands during the MAMM project in summer 2012, Atmos. Chem. Phys. Discuss., 14, 8455-8494, doi:10.5194/acpd-14-8455-2014, 2014. Allen, G., Illingworth, S. M., O’Shea, S. J., Newman, S., Vance, A., Bauguitte, S. 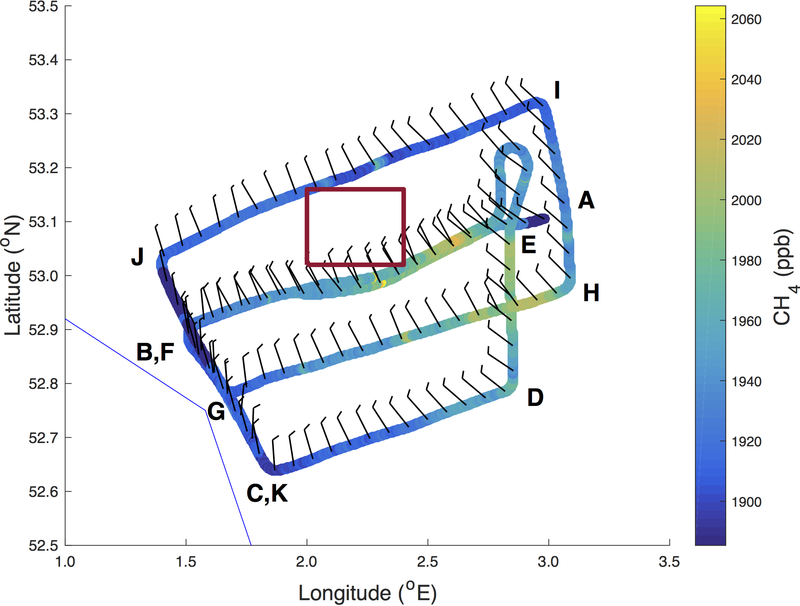 J.-B., Marenco, F., Kent, J., Bower, K., Gallagher, M. W., Muller, J., Percival, C. J., Harlow, C., Lee, J., and Taylor, J. P.: Atmospheric composition and thermodynamic retrievals from the ARIES airborne TIR-FTS system – Part 2: Validation and results from aircraft campaigns, Atmos. Meas. Tech. Discuss., 7, 3397-3441, doi:10.5194/amtd-7-3397-2014, 2014.